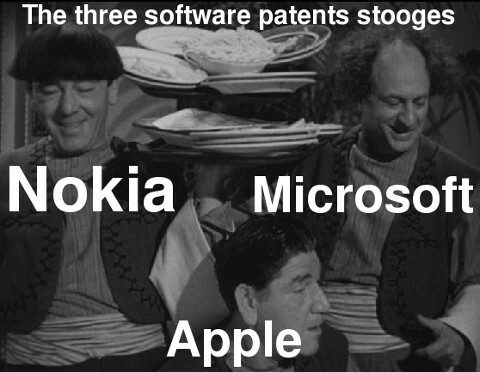 NOW that Microsoft is suing like crazy, it’s really time to abolish software patents. About 85% of Microsoft's patents are software patents and they are being used to bully and extort servers companies such as Amazon and Salesforce (both use GNU/Linux). What does Google do? Google’s support of software patents is not acceptable and the company takes a similar approach to IBM's when it comes to them. Google just makes promises and concessions about its software patents, which might not be as effective as just working to abolish software patents for good (not that Google would necessarily want that). What is Google thinking? Why spend so much effort assigning patents to the company at the expense of engineers’ time? Later on, when Apple obtains software patents and sues with them (even targeting the Linux-based Android) Google declines to comment as that would make Google a hypocrite. Here is one of the Apple ‘fan’ sites bragging about software patents from Apple. The target device may receive the user selection and transmit data 266 corresponding to the selection to the initiator device 10A. For example, the Facebook script may include instructions directing the target device to transmit the confirmation or rejection to the initiator device as the confirmation data. The initiator device may then receive the confirmation data and display the screen 232 indicating that the friend has been successfully added and that the workflow is complete. Although the specific screens displayed on the devices 10A and 10B may vary, the interaction between the initiator device and the target device may occur in a similar manner for each action within a workflow. It is widely believed that Apple’s target is Google’s Linux-based Android which is making inroads into Apple’s smart phone territory. But Google might be too big for Apple to fight with. HTC, one of the core partners of Google, seemed to be an easy target for Apple. Most of us users of Mozilla’s Firefox browser are used to getting new versions of Firefox from Mozilla, but, like many open source projects, Firefox has already been forked into other versions. Now, as OSnews reports, a new fork of the browser is taking shape. Dubbed Wild Fox, one of the more interesting new aspect of it is that it supports the H.264 coded for video. However, the way the new fork treats patents could cause trouble. Had Apple (and Google or even Microsoft) actually helped promote Theora, none of this would be necessary. But being the software patents proponents that they are, they seem resistant to free/libre codecs. Google has made some commitments, but it still offers nothing but H.264 (or other patent-encumbered codecs) in its huge number of videos. Formally, software patents are not legal in Europe but in practice they seem to be. In order to resolve this bizarre situation once and for all, the EPO consulted the EBoA, whose decision finally came some days ago [1, 2, 3, 4, 5], pretty much to say that they could make no decision. Isn’t that grand? They only increase this state of vagueness and the EPO has opposers of software patents hanging on and relying on nothing substantial. It’s like a delaying tactic and the head of the EPO meanwhile escapes her position on a higher note. André Rebentisch disagrees with the EBoA assessment from Marks & Clerk and he is clearly dissatisfied with the EPO’s embellishment/spin. The spin machine of the European Patent Office in Munich in full motion. Its Enlarged Board of Appeal declared the referred questions of EPO-President Alison Brimelow inadmissible. A court would stop here but the EBoA is no Court but just an administrative appeals chamber and not bound by judicial standards, so they also discuss the substance. In one recent deal we were left with the thorny problem of Indemnity and who pays for it. Typically, if you are using proprietary code you are buying a pig in a poke (buying something in a black sack that the vendor says will do the job). The case of indemnity arises if a patent troll claims ownership and then sues the user for a multi-million dollar sum.